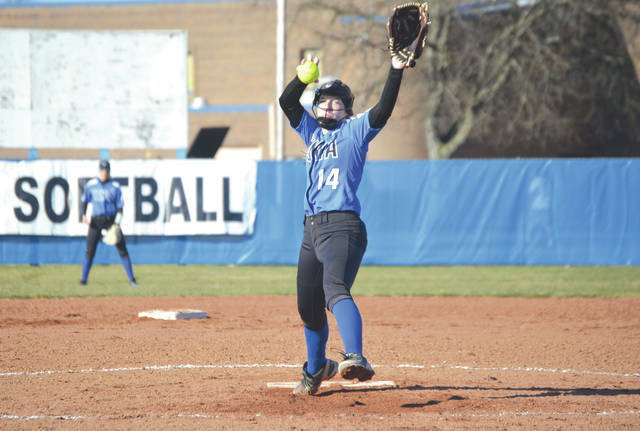 Senior pitcher Bailey Oliver delivers a pitch during Xenia’s 15-3 run-ruled win in five innings, March 26, against visiting Greeneview. Greeneview’s Alexa Simpson slides into third with a second-inning triple, March 26 at Xenia High School. 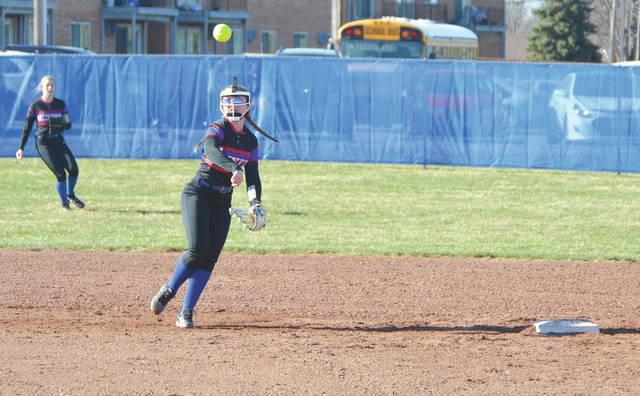 Freshman Ciera Lloyd collected three singles in three at-bats in Xenia’s 15-3 run-ruled win in five innings over Greeneview, March 26 at Xenia High School. 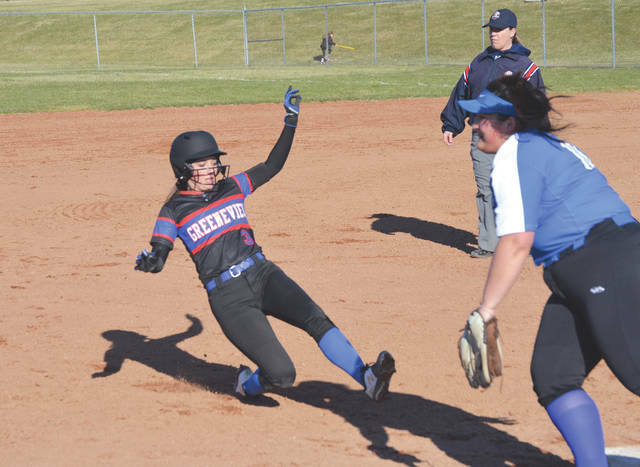 Rams shortstop Kassidy Adkins throws out a Buccaneer runner at first, in the fourth inning of Tuesday’s girls high school softball game at Xenia High School. 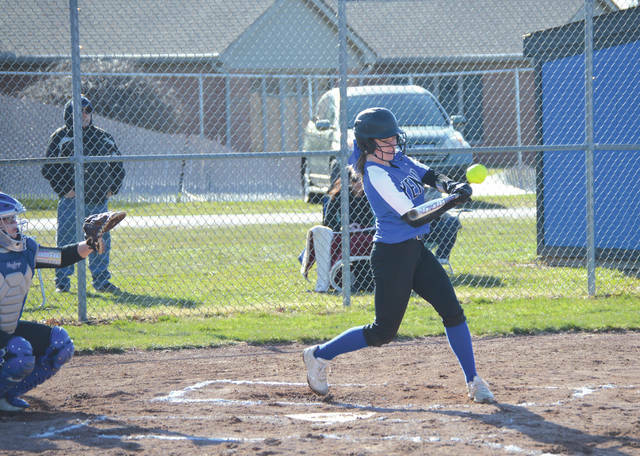 XENIA — With a balanced lineup and solid pitching, the Xenia Buccaneers softball team run-ruled visiting Greeneview, 15-3 in five innings of play, March 26 at Xenia High. Greeneview (0-1) scored first, but Xenia never panicked. Instead, the host Bucs plated six runs in their half of the inning to take the lead for good. In Tuesday’s win, all nine Xenia starters reached base at least one time in the four innings they got to swing the bat. Lead-off hitter/starting pitcher Bailey Oliver had two singles, stole three bases, walked two other times and scored three runs, senior infielder Sydney Smith singled and tripled, walked twice, knocked in two runs and scored three others, and freshman Ciera Lloyd was perfect at the plate at 3-for-3 with two stolen bases and a run scored. “It was a team effort tonight. We were patient at the plate, and I think we put forth a solid team effort,” Miner said. “When we all stick to the plan, and that’s ‘Play as a team,’ we always seem to be able to get it done. Oliver pitched the win for Xenia (2-1), scattering six Rams hits through five innings of work with a pair of strikeouts and two walks. Greeneview lead-off batter Alexa Simpson had a hand in each of the three Rams runs. She doubled to lead off the game, then scored on Baylee Anderson’s single to right. Then in the second inning, Simpson belted a triple to deep left field to bring home Anderson and Megan Hess with Greeneview’s other two runs. Simpson was the only Rams batter to have more than one hit in the contest. Simpson also showed her toughness in the opening inning. She took an Oliver leadoff line drive off of her face guard to start the game, but stayed on the mound through the third inning. Greeneview has two more games in the next two days. They head into Dayton to take on Chaminade Julienne at 5 p.m. on Wednesday March 27, then they open Ohio Heritage Conference play at home when rival Cedarville comes to Jamestown for a 5 p.m. contest on Thursday, March 28. Ratliff says there’s a chance the Rams will make up a game with Springfield Shawnee on Saturday as well. Xenia can enjoy a few days off, then the Bucs will head north to play a 5 p.m. Friday March 29 game at Tipp City Tippecanoe.